Fly high over the Caribbean Sea while parasailing in St Martin. 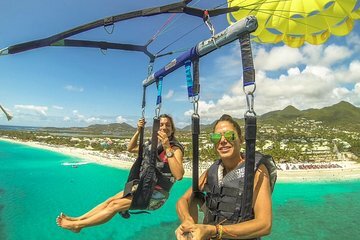 During this 10-minute activity from Orient Beach, get the feeling of flying in the safest way possible with expert guidance from your experienced instructors. View the landscape of the tropical island and the azure waters from high above; be sure to bring your camera for spectacular photo ops. All gear, access to Orient Beach facilities and exciting jet ski ride to and from the parasailing boat are included.